Killer Characters: Amateur Sleuth? Me? Have you heard the news? I'm an amateur sleuth! And all this time I thought I was just the White House executive chef. Sure, I've helped the Secret Service out a few times. Saved the First Family, a diplomat, and a few other people... yeah... but does that make me an amateur sleuth? I guess it does because right now, Jen Forbus is sponsoring a "Best Amateur Sleuth" contest and I'm in the running. Seriously! This is being run like a March Madness event and I'm excited and flattered to be included. I mean, you know who else is in there? Miss Marple. Nancy Drew. These are people I grew up reading. Hmm.... maybe that accounts for my curiosity and involvement in all things criminal. Do you think so? I'm up against the Hardy Boys in this round - uh oh! I used to read them too, but not nearly as much as Nancy. She was my idol. The way she investigated, and stood up for all that was right. She was cool, confident, and a leader. I'm beginning to see a pattern here. I wonder if I've been trying to emulate Nancy all this time. I'm going to have to give this some thought. I'll tell you this much. If I were up against Nancy Drew in this contest, I'd still be asking you to vote, but not for me - FOR HER! Nancy is up against Jack Reacher this time. That'll be tough. I hope she pulls an upset and beats him. But while you're here, answer me this... a completely different approach. If you could pick two amateur sleuths to work together solving a case, who would you pair up? 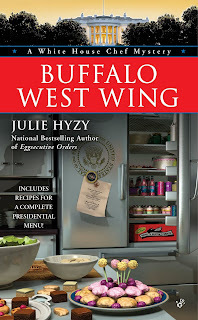 Come visit the White House in Buffalo West Wing! I'd love to see you there! I voted for you (one of my fav amateur sleuths)! Two sleuths to work together? Hmm... How about you, Ollie, and Vicky Bliss from Elizabeth Peters' series. I think a chef and a museum curator would make a great team! You and Tricia Miles from the Booktown mystery series. The reason is because Angelica would love to talk with you about cooking. I like that idea, Dorothy, but wouldn't it be fun if Casey and I worked together? She could cover half the White House, I could cover the other and we'd get the next conspiracy uncovered in no time! Dru - Great idea! I love hearing all about the goings-on around Haven't Got A Clue. That Angelica is a hoot! How about Nancy Drew and the Hardy Boys? Hey, if you think about it, chefs are always multi-tasking, and planning their next moves. Sleuthing fits right in. Nero Wolfe (wouldn't it be fun to discuss a current case over dinner at his place?) and ... shoot, I got sidetracked by the food. Who else would appreciate such a gourmet opportunity? Maybe Ollie could come along and swap recipes? Ollie, I admire you greatly! I've already voted for you in round two. Sure, I like the 'Boys', but your adventures are very entertaining and contemporary. With recipes yet! What's not to love? Janet - I think they might have tried that combination a few years back. With Sean Cassidy and that other handsome guy. Can't remember his name. My author had an enormous crush on David Cassidy (of the Partridge Family) but Sean never cut it for her. Sheila - Good point! There's so much going on -- always. Wow, swapping recipes with Nero Wolfe?? I would love an opportunity to do that. You think Archie might help me defeat the bad guys? Mary Jane - Thank you so much! I think I'm up against tough odds this time, but I'm hopeful! Thanks for the boost! What? Me team up with Ollie? I'm a simple gardener. NOT a sleuth. Now, I've got some Mile-a-Minute weeds to go pull. They're nasty devils. Then there's...er...someone I want to question about a certain incident that happened at the White House a few days ago. But I probably shouldn't talk about that right now. Charlotte Bessette. You'd quickly catch the bad guys while putting on a wine & cheese tasting followed by a gourmet meal. Am heading right over to the voting! Ollie, I voted for you ( I mean, Avery did, on my behalf). BTW, I like Erika's idea. I could team up with you any day. Maybe I could come visit the White House (hint hint). 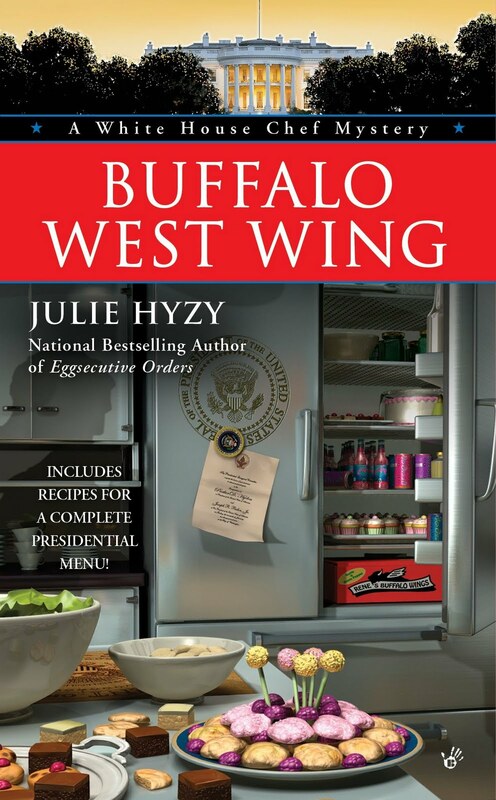 I've got some great presidential recipes in mind!! And the new president's son, Josh, would probably love to learn about cheese, don't you think? Oh, Casey... Not a sleuth? Uh-huh. BTW, I can't wait to learn more about your work in the White House. Let's do lunch sometime. I'll cook. Erika - what a wonderful idea! She's so much fun! I'd love that. Charlotte - oh come visit anytime. Just let me know a little bit ahead so I can clear you with Tom. Er... Agent MacKenzie. He's in charge of all the comings and goings. I'd love to talk cheese with you. And you're right, I bet Josh would have a blast! I don't have kids, as you know, but I bet your experience with your nieces would help me know better how to work with Josh and his sister. This contest sounds really funny! I voted for you Ollie! And I agree with you! I think you and Casey Calhoun would make an awesome pair. I'd love to do lunch, Ollie! Especially if you're cooking. YUM! I'll bring the veggies. I have a healthy crop of hot peppers growing in my kitchen window. I use the habeneros to make my own pepper spray. Don't forget to give me your recommendations for what to plant in the White House kitchen garden. It'll be installed soon! D. U. - It does, doesn't it? Shiloh- Thank you!! I'm eager to work with Casey. Casey! Love that pepper spray idea. I may have to borrow it. This guy was following me on the Metro the other day and... well, I'll tell you about it later. You bring the veggies, I'll cook and we'll discuss the kitchen garden. It's a date! How about Ollie and Grace? Oh, I had the biggest crush on Shaun Cassidy when I was little! Whoa, Ollie and Grace? Love that idea, Krista! Heather - I understand it, but I really loved his older brother. He did a concert nearby recently and I was sorely tempted! Hmmm...Teaming up amateur sleuths. Okay - I'm thinking that I need to team up Ollie with Stephanie Plum...she need some major help with her dietary issues. I think Ollie could come up with some really great alternatives to donuts. Joelle - that's a great plan! Do you think Stephanie would be up for it?